Just about everything we surround ourselves with has been in a container at some point. 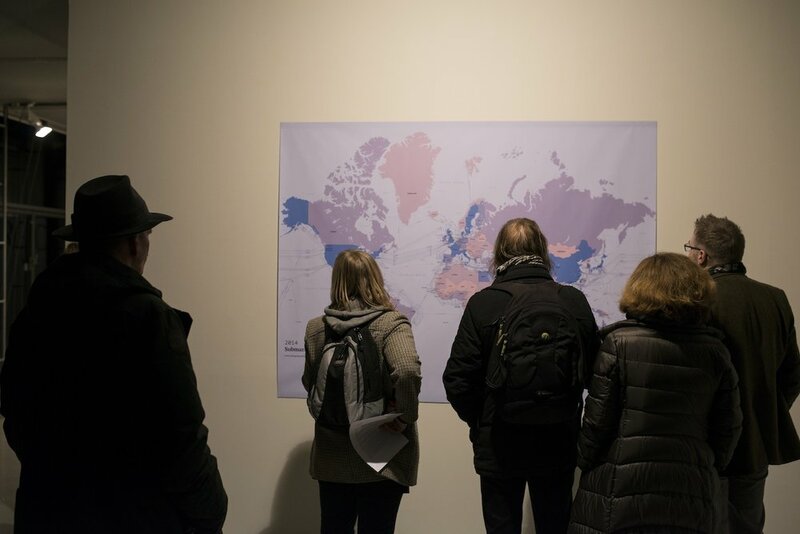 The exhibition CARGO examines questions of communication across borders by land and by sea, the distribution of goods and benefits, access to resources and consumption and transport routes. It relates these themes to the classroom, a place where worldviews are made and knowledge is imparted to those who are to further develop society and democracy. Nine modified school desks, audio recordings of individuals' stories from different parts of the world and a multi-channel sound composition are the main elements in CARGO. World map; a survey of the subsea fibre optic network 2014. CARGO circles around the connection between technological development, mobility, and our accumulated personal ballast in the form of experiences and our location in a geographic, economic, social and cultural field. In CARGO we encounter personal stories, provided through headphones at the school desks, stories that have been collected by Urstad through interviews with different people she has met and who are a part of her life. We meet the Zimbabwe-born curator Clare Butcher, who relates and reflects on her experiences from the streets of Madrid and Cairo in spring 2011, and how she, as a white person growing up in Zimbabwe, could not take part in public protests. Vassilij Vassilevich, a 92-year old radio operator from Kaliningrad, recounts his experiences as a radio operator back in The Soviet Union years and up till the present day, and talks about the importance of radio as a means of communication in Russia throughout several decades. Smallholder Alfhild Toft puts technological development in perspective in her personal story about doing laundry in the river. Michel Mutambuyi shares the story of his journey from Congo, his homeland, to South Africa ten years ago, and speaks of his work as a tour guide and how he for the past ten years has struggled to obtain a residence permit, work, house and a home in the new country. More images of CARGO at VOLT website.